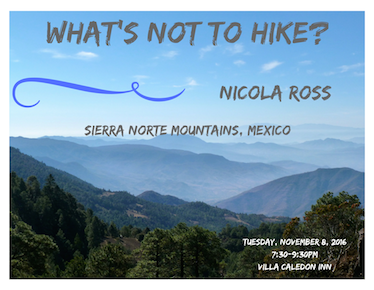 A talk by Caledon travel writer Nicola Ross that includes the story of seven days walking in the Mexican mountains takes place on Tuesday, November 8th at Villa Caledon Inn in Caledon East from 7:30 – 9:30 p.m. Contact Nicola at nross@woodrising.com for registration details. This entry was posted on October 27, 2016 by Alton Chapter in Writer's Ink News and tagged author readings, travel writing, travellers tales.